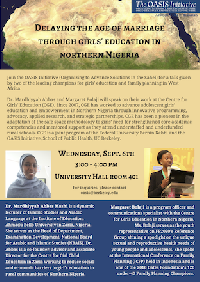 Dr. Mardhiyyah Abbas and Margaret Bolaji will speak on their work at the Centre for Girls Education (CGE). Since 2007, CGE has worked to advance adolescent girls education and empowerment in Northern Nigeria through innovative programming, advocacy, applied research, and strategic partnerships. CGE has been a pioneer in the adaptation of the safe space methodology to girls need for strengthened core academic competencies and mentored support as they attend understaffed and underfunded rural schools. CGE is a joint program of the Federal University Bernin Kebbi and the OASIS Initiative, School of Public Health, UC Berkeley. Dr. Mardhiyyah Abbas Mashi is a dynamic lecturer of Islamic Studies and Arabic Language at the Institute of Education, Ahmadu Bello University in Zaria, Nigeria. She serves as the Head of Department, Examination Development, National Board for Arabic and Islamic Studies (NBAIS). Dr. Abbas is a co-founder, advisor and associate Director for the Centre for Girls' Education in Zaria working to reduce social and economic barriers to girls education in rural communities of Northern Nigeria. Margaret Bolaji is a program officer and communications specialist with the Centre for Girls' Education in Northern Nigeria. Ms. Bolaji serves as the youth representative on FP2020s Reference Group shining a spotlight on the unique sexual and reproductive health needs of young people and adolescents. She spoke at the International Conference on Family Planning (ICFP) held in Indonesia and is one of the 2016 Gates Foundations 120 under-40 Family Planning Champions.